Good fundamental investing is all about maximizing return while minimizing risk. To do so requires an understanding of your financial objectives, your risk tolerance, and the historical performance of a stock and bond portfolio by different weightings. To determine your risk tolerance, simply ask yourself how much you’re willing to lose in your investments before needing to sell. If you never plan to sell because you know the stocks and bonds have generally gone up and to the right for decades, perhaps you have a high risk tolerance. If you plan to take profits if the stock market is down 20% or more, then perhaps you have a medium risk tolerance. Just know that whatever you think your risk tolerance is, you’re likely overestimating your risk tolerance. When people started losing big money during the 2008-2009 financial crisis, there was mass panic because they were also losing their houses and their jobs. Zero risk: Treasury bonds held to maturity, money market accounts, and CDs where the FDIC guarantees up to $250,000 in losses per person. Minimal risk: The highest rated municipal bonds in your state. You can find 20-year municipal bonds yielding 4%+ federal and state tax free. 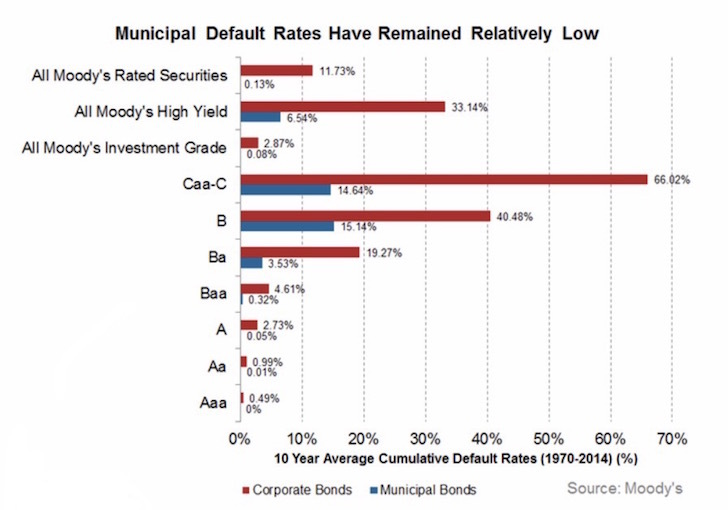 AAA-rated municipal bonds have default rates under 1%. In 15.5 years, you’ll double your money. So long as you hold your municipal bond until maturity, you will get all your principal back plus the annual coupon, if the municipality doesn’t go bankrupt. 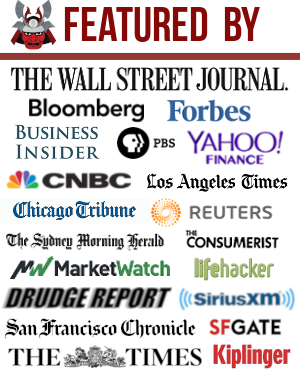 Moderate risk: The Barclays U.S. Aggregate Bond Index provides about a 5% annual return each year, depending on which 10 year time frame you’re looking at. You can take more risk buying individual corporate bonds, emerging market bonds, or high yield bonds. But overall, buying the aggregate bond index is a moderately risky investment. 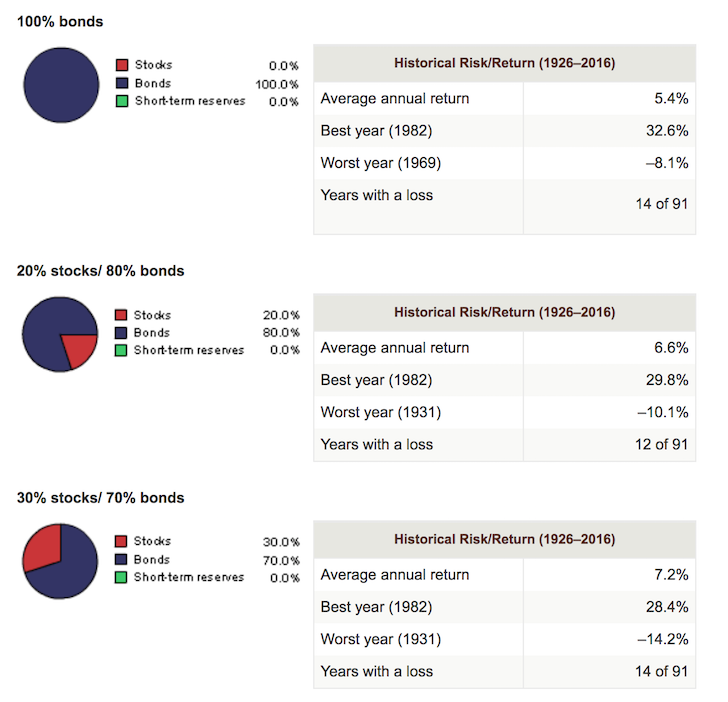 A 0% weighting in stocks and a 100% weighting in bonds has provided an average annual return of 5.4%, beating inflation by roughly 3.4% a year and twice the current risk free rate of return. 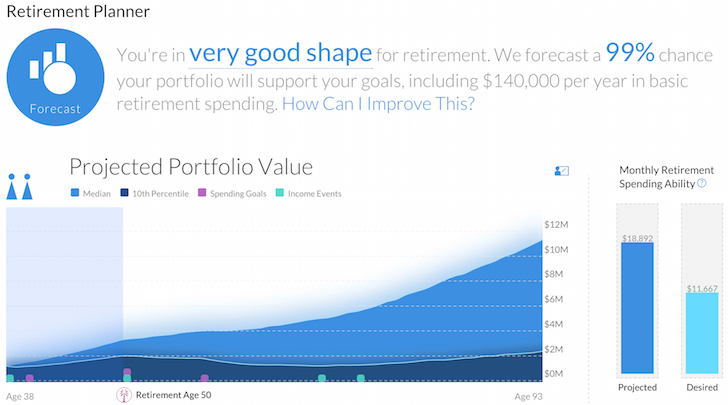 In 14 years, your retirement portfolio will have doubled. With a 30% allocation to stocks, you could improve your investment returns by 1.8% a year to 7.2%. But with a potential improvement of 1.8% a year, you increase the magnitude of a potential loss by 75% (from -8.1% to -14.2%) based on history. A 40% weighting in stocks and a 60% weighing in bonds has provided an average annual return of 7.8%, with the worst year -18.4%. A 50% weighting in stocks and a 50% weighing in bonds has provided an average annual return of 8.3%, with the worst year -22.3%. For most retirees, allocating at most 60% of their funds in stocks is a good limit to consider. An average annual return of 8.7% is about 4X the rate of inflation and 3X the risk free rate of return. But you’ve got to ask yourself how comfortable you’ll feel losing 26.6% of your money during a serious downturn. If you’re over 65 years old with no other sources of income, you will likely be sweating some bullets. Growth based portfolios are for younger investors or investors who have a much higher risk tolerance. A 70% weighting in stocks and a 30% weighing in bonds has provided an average annual return of 9.1%, with the worst year -30.1%. That’s a pretty steep decline. 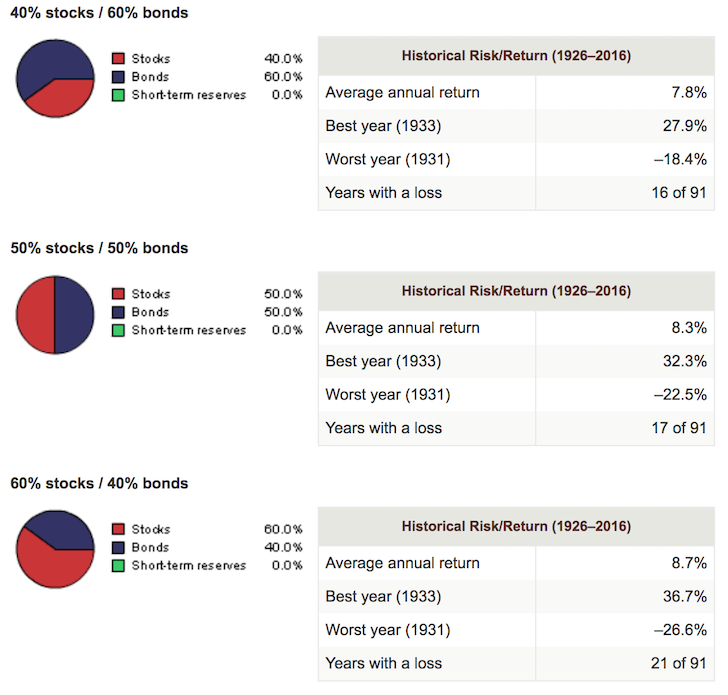 A 80% weighting in stocks and a 20% weighing in bonds has provided an average annual return of 9.5%, with the worst year -40%. 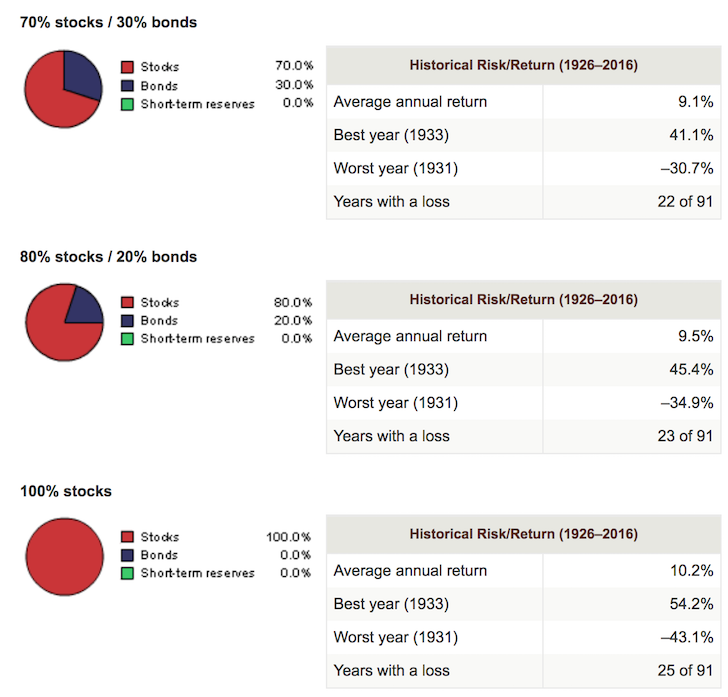 A 100% weighting in stocks and a 0% weighing in bonds has provided an average annual return of 10.2%, with the worst year -40.1%. We saw this sell-off happen in 2008-2009 where many investors sold at the absolute bottom and took 10 years just to get back to even. With a 100% stock allocation, there have been 25 years of losses out of 91 years, and in the worst year you would have lost 43% of your money. Losing 43% of your money is fine if you are 30 years old with 20+ years of work left in you. But not so much if your goal is to spend the rest of your days cruising around the world. In my 20s, I had a 90% – 100% stock allocation. In my 30s, I had a 70% stock allocation. And now that I’m in my 40s with a non-working spouse and a little boy to take care of, my stock allocation is limited to a 60% allocation. You can also consider various stock allocations by bond yield as well. 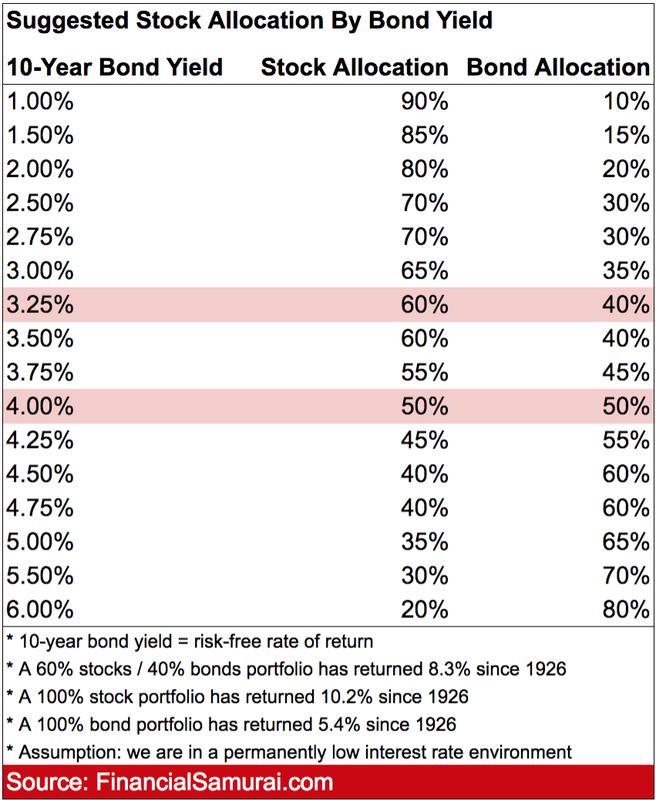 Given you can earn a risk-free rate of return with treasury bonds, at some bond yield high enough, there’s no point taking too much risk in stocks. The pain of losing money is always much worse than the joy of making money. If you’ve already got all the money you’ll ever need, there simply is no point taking outsized risk at all.